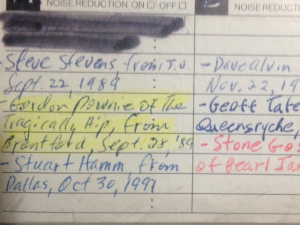 Over the last couple of weeks, since the awful news about Gord Downie came out, I’ve been posting excerpts from the first interview I did with him, back in 1989. The first one had him talking about a couple of the tunes on the Hip’s then-new album, Up to Here, and the second one focused on that album as well ’cause, you know, “it’s a mighty hot one”. The third (and maybe last) excerpt from that chat with the up-and-coming 25-year-old has him calling me up from a roadside stop near Brantford, Ontario (“the home of Wayne Gretsky”). I asked him about the music scene growing up in Kingston and his band’s biggest influences.